Released by Tecmo in March 1989, Ninja Gaiden follows the journey of Ryu Hayabusa who sets out to avenge his father's death. Judging from the fantastic cut scenes, it also involves a woman with a mullet who may or may not be trying to kill him. 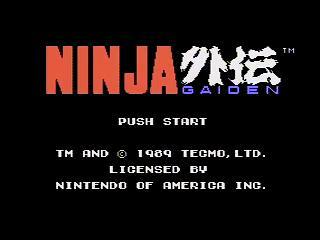 This game set the precedent for all subsequent ninja games, in that you run around in broad daylight, kill any and all things in your path, and do no less than 30 flips every time you leave the ground. This game is known to be extremely frustrating, mainly due to the difficulty of the platforming and the unfairness of the birds. Best time: 0:12:00 by Daniel 'Dxtr' Eriksson on 2012-12-18. Best time on Shadow Warriors (the game's European version): 0:13:32 by Kristian 'Arctic_Eagle' Emanuelsen on 2007-12-29. Best Low% time: 0:13:07 by 'sinister1' on 2012-05-11. I want to start out by saying thank you to SDA for being a such a great community of both runners and work they put through all these years and making it easily one of the places to see magic happend. Watching so much skilled people be able to pull these things off is such an amazing feat. It's been a long and hard road. Finally.. we're there! Big thanks to Sinister1, Arctic_Eagle, Duckfist, IrregularJinny, Arcus. I mean.. you are all great runners! Awesome runners! Sinister specially for being such a great dude helping out with some of the strats and starting up the weekly races of Ninja Gaiden, he is truly the Ninja Gaiden-elder amongs us here. There isn't much to say but... Enjoy, this run is pretty sweet! Shadow Warriors in 0:13:32 by Kristian Emanuelsen. Shadow Warriors is the european version of Ninja Gaiden. It's slightly modified from the american version, with floatier jumps, slightly slower etc. I felt the need to improve my old Shadow Warriors run as I heard Jim Hanson "The Ninja" demolished the old NTSC-WR with 25? seconds. Shadow Warriors/Ninja Gaiden is a nice challenge to speed run, and it's still my second favorite NES-title. This run went pretty well for me, especially the hack and slash platforming play. The Demon could be killed faster as usual, but I'm not very good at him unfortunately. Thanks to Tommy Montgomery for going through the pain of recording his Ninja Gaiden run, a game he doesn't seem to hold in high regards, teaching me (and others) the basics of the game and more. Thanks to Josh Styger for his 13:33 Ninja Gaiden run which I learned a few more details from. And thanks to the 'SDA-crew' for transferring from VHS and putting my run up on site etc. Hope you all enjoy the run! Sword only in 0:13:07 by 'sinister1'. Thanks to SDA for hosting. Thanks to Heidman(rage) who inspired me to try low %. Thanks to UltraJman for agreeing to race me sword-only at AGDQ '12. Thanks to all my stream viewers who made it easier to press on with such a challenging run. This run started when I first saw a Nico sword only run and though "hrmm that is a pretty cool way to play this game." At the time I was still learning Ninja Gaiden and did not really believe I could compete with the current SDA time (12:32 by Arcus iirc). I eventually realized that sword-only would count as a seperate category and decided to make sure in the forums and it was confirmed low %. Thankfully you are allowed to get points and ninpo as there would be some additional challenge involved and time wasted if you had to avoid those altogether. You want to avoid ninpo as much as possible though since it gets counted down seperately from the clock at the end of each Act and thus wastes time. The key to doing low percent is mastering the very strange hitboxes in this game. The best thing to do is to pretend you do not have a sword at all and you are actually trying to punch your enemies. Or if you prefer pretend you have the sword from Lagoon. Either way, this will ensure you slash enemies consistently rather then depending on luck. The hardest part of planning for this run was the boss fights. Without the good ol' spinslash to just one hit kill everything you actually have to think and plan, how annoying. The bosses of Act I, II, and V and very straightforward, just mash and slash the best you can. Act III strats were developed to allow maximum hits per jump and by following Basaquer in the air and taking advantage of his backloaded hitbox. I tried out a few mashing strats on him but they were ineffective.The Kelbeross is a big determinant of how a run will turn out. There are several RNG factors involved, the first of which is how quickly the "real" Kelbeross leaves its platform. Fortunately I had been trying to develop a faster way of doing the multiple air slash technique in order to have better fights against Jaquio and the Demon Statue. I remember seeing a Nico run that I felt was legit and the guy was slashing like crazy in those final fights. For some reason I did not immediately cry TAS and thought about how it would be possible to do that. I knew some sort of mashing technique would have to be employed as holding a controller with a normal grip I could only manage 3 and sometimes 4 slashes per jump. My most effective mashing is done using and overhand technique with my middle finger so I figured if I could use that and my thumb maybe it would work. I realized that I had to switch my grip completely on the controller and thankfully there is a fade out/fade in for boss fights which gives just enough time to properly switch grips. My first forray into the new mashing technique was wildly succesful and I was getting 5 or 6 slashes per jump, but not consistently. Eventually after much practice I was able to become consistent with it and developed a rhythm that makes it work instead of just wildly mashing and hoping. It became a very controlled mash. Eventually Duckfist would show me up with insane mashing that allowed him to kill Kelbeross before it even left the platform (16 hits), and the best I have managed is still just 13 hits. The real challenge was Jaquio. I had to learn how to actually control my ninja with this crazy grip and that took some doing. The Demon Statue strat was hard to figure out. I had seen in done in 4 different ways and was unsure which would be best. I eventually settled on the technique of skipping the tail and going straight for the heart as was done in Arcus' 12:32 run. I still think it is the best choice even though it is not technically the fastest. Most of the typical boosts from weapons runs are employed in this run outside of the famed 6-2 boost. The reason it is skipped is because you really want to minimize damage in Act VI in order to allow for the 6-3 boost that is absolutely necessary to get through that screen. 1-1: 119 (119) This is a pretty standard 1-1, might have lost a few frames but nothing major. 1-2: 146 (146) This boss fight could be slightly faster if I had turned around just a bit sooner. The hitbox on this guys sword is a joke and he can literally be slashing through Ryu's head and missing. Minimal frames lost. 2-1: 109 (110) It is very easy to lose frames in a ton of places during this stage, and I was not on my A game. Nothing to reset over, but frames are important and add up over the course of the run. 2-2: 104 (106) Not much I could do about the RNG, otherwise the level went smoothly. I am not gonna reset over something this small that I have no control over. 2-3: 144 (144) Standard stuff. You want to get a 12/4, but without perfect rhythm 11/5 will cost some frames. 3-1: 130 (130) Using this strat my time is just fine, I think there is a faster strat that Exo uses and it saves some frames (maybe 10ish) that I would look into if I every improve this run. 3-2: 118 (119) Mostly solid outside one missed hit (nice hitbox) and some mediocre RNG. 3-3: 139 (???) good boss fight, favorable RNG with the bullet patterns which are random. 4-1: 115 (118) screwed up bat boost in the bad way (getting knocked back rather than just falling forward onto the platform below) This is actually the most costly single mistake in the entire run, but at the time was not something worth reseting over. 4-2: 119 a bit slow in a few spots cost a handful of frames, otherwise solid standard stuff. 4-3: 112 (113). Good execution overall outside of the walljumping error. This stage always gave me a lot of trouble for some reason, so I was actually pretty happy with this. 4-4: 141 (143) Pretty mediocre mashing here. I only got 4 slashes on the 1st jump, 3 of which connected. The 2nd jump landed 4 of 5 slashes. The final jump I only got 3 of 5 to connect with an early jump off. Luckily for me the jumping pattern was favorable and I finished the job quickly after that. 5-1: 116 (117) Without using the very damaging and high risk boost in this level 116 is the best you can do. Nice ninja reflexes allowed me to avoid a hit on the sword-throwing guy. 5-2: 111 (115) This stage is pretty tough, so I expect to have mistakes sometimes, but this was somethin else. After a good start I missed the jump at the end of 5-3c, and then 5-3d I messed up gates of hell and missed the damage boost. At this point I think I was saying "the run is over." 5-3: 102 (104) This stage was going pretty well but I got trolled hard in 5-3e when for the first time ever I got hit and stuck into the wall by the sword throwing guy. 5-4: 142 (143) 4 cycle, bad execution. This boss can be done in three cycles if you position yourself correctly and get the proper mashing rhythm. 6-1: 130 (131) This was perfect, the only reason it was not a 131 is due to the way the clock works in this game, which is a long story. 6-2: 102 (103) I got good luck for the most part in this stage which saves a lot of time. I made a minor mistake at the end which cost maybe a quarter of a second. 6-3: 104 (105) This was mostly awesome luck and execution-wise. Lost a few frames here and there. 6-4: 147 (147) 4 cycle is slow but not by very much. 1st jump 4 of 4. 2nd and 3rd jumps were 5 of 6. The hitbox on this guy is much bigger than the Kelbeross so 3 cycling this guy is something that should happen more consistently. 6-5: 138 (141) almost perfect. Poor jump timing on the 3rd pass and I got hit by a fireball, then I was not aggressive enough to chase Jaquio down for the last two hits and let him come to me. 6-6: 139 (141) awesome luck. I inadvertently got hit by the tail when I first try to jump in and this mistake actually worked in my favor by allowing me to avoid getting hit at all while slashing the heart. When I saw my time as I hit the final split I was ecstatic and jumped up screaming with joy. I had beaten the mighty Hotarubi, who is a legend to me. His 0:32 in-game Super Metroid run was one of the first speedruns I ever saw and was definitely my favorite. I later found out that Hotarubi was even more prolific than I originally thought because he had world records on a ton of games, several of them highly competitive titles. I will say that his 13:15 (RTA timing) Ninja Gaiden sword only run was probably one of his less impressive runs relatively speaking mostly due to a lack of competition in the category. However, Hotarubi does not strike me as a person that would make a "bad" run and stop trying. I remember when I first began running this category I thought sub 14 would be a good time, then 13:45, then sub 13:30 and so on. I never really intended to beat Hotarubi and would have been happy submitting a run that did not beat his. This is after all the first run for this category and as far as I know most times a benchmark run is submitted it is beatable and sometimes not highly optimized. I know that sub 13 is possible but that would be pushing things to the limit. I would like to get sub 13 one day but for now I am happy with this run.